Just a couple of years ago, it was a source of wonder: “Wah! In Indonesia, even the hookers/farmers/becak drivers have cell-phones!” The citified loved to take photos of small buffalo-riding Javanese children or half-naked Papuan adults busily chatting on their cell-phones (HP, or “hah pay” in Indonesian, from the English Hand Phone). Now, cell-phones are such a universality that no-one even bothers to take note. But I still find it amusing that cell phones have entrenched themselves quite so firmly even in places where there’s no electricity. This has led to a whole secondary industry, illustrated by the roadside stall in the small town of Enarotali, in the highlands of Papua, pictured above. CASS HP: what can it mean? 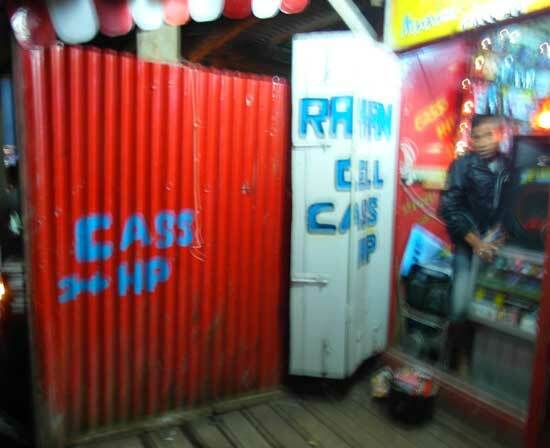 In Indonesian, “C” is pronounced “Ch”: Chass HP, the local rendering of Charge HP. This shop will fill your battery for you, for 5,000 rupiah, about 50 cents. You’ll find stalls like this all over Indonesia, and plenty of people using them even in areas with no phone signal, especially near areas where electricity is sporadic or non-existant. Because after all, even if you can’t talk to anyone on it, a charged phone makes a very good torch. 1 Comment on "The essentials of life: handphones where there’s no power"
… and to call on a torch.